After curing, remove polyethylene sheet in accordance with instructions by the manufacturer. Solid film lubricant (item 13, app D) is to be used only as an exterior surface protective finish and touch up. If solid film lubricant comes in contact with recoiling parts or functional surfaces of the rifle, remove immediately by washing with technical dichloromethane (item 8, app D). Wash area with technical dichloromethane (item 8, app D) (methylenechloride) to remove all dirt, grease, and foreign material. Roughen area to be refinished with abrasive and clean surface again. Do not touch the area with fingers. Inspect for damage and wear. Replace all defective parts. Spray a coat of solid film lubricant (item 13, app D) in accordance with instructions supplied by the manufacturer. Dry 24 hours before handling. Place front sight base (1) in a bench vise. Remove front sight post, plunger, and spring. Heat sight guard (2) and bend with pliers (3). 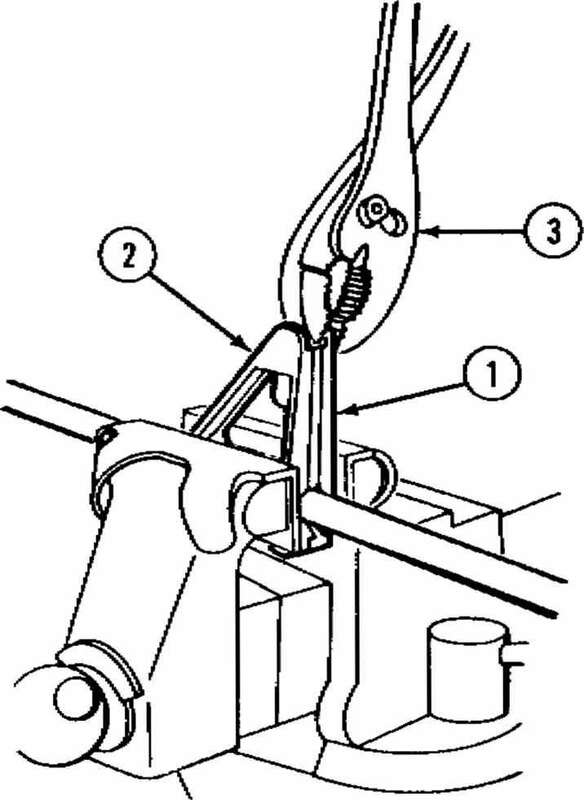 Use copper or brass caps (jaw inserts) on vise to prevent damage to sight base during clamping. (See page 2-33.) Remove spring before heating. (Heat will damage spring.) The sight post and plunger may be reused unless damaged. The sight guard (2) can be put back as nearly as possible to the original position. Dry cleaning solveni is flammable and toxic and should be used in a well-ventilated area. The use of rubber gloves is necessary to protect the skin when washing rifle parts. Roughen surface with abrasive cloth (item 6, app D) and clean with dry cleaning solvent (item 9, app D). Wear rubber gloves (item 10A, app D) and use wash pan (item 13A, app D) to apply solvent. Allow front sight housing to air cool. Apply solid film lubricant (item 13, app D) to cover the damaged finish.